On day 27 of our 30 day challenge we are answering the question: How to sleep with Yoga. The answer I am going to share with you is something called: yoga nidra or sleep yoga. Yoga nidra or Sleep Yoga is a form of meditation where you get the benefits of meditation and a deep night sleep. If you have practiced yoga before you will be familiar with savasana or corpse pose where you lie down at the end of a yoga class. Yoga nidra is kind of like that except you get to lie down for longer while you are guided through rotating your consciousness through your body. We are a culture suffering from chronic anxiety, chronic tension, and panic attacks. We are stressed out, on high alert and feel a constant urgency from everything. We are slaves to our do to list. We are wired and frazzled. We are sleep deprived and many of us experience chronic insomnia. The insomnia anxiety cycle is real and I have nothing but compassion for all of us who suffer with it. We often carry the stress of our lives into our sleep. Then we wake up and we do not feel rested. One of the best ways I know how is through a guided meditation called yoga nidra. Nidra means sleep. Yoga nidra is a sleep based conscious relaxation meditation technique. It is a yogic sleep where you are guided from a dream state into a deep sleep state and finally to a deep state of relaxation where your thoughts drop right off and yet you are still aware. Before I answer the question, How to sleep with yoga, I want to point you to the best resource for yoga to help you sleep. 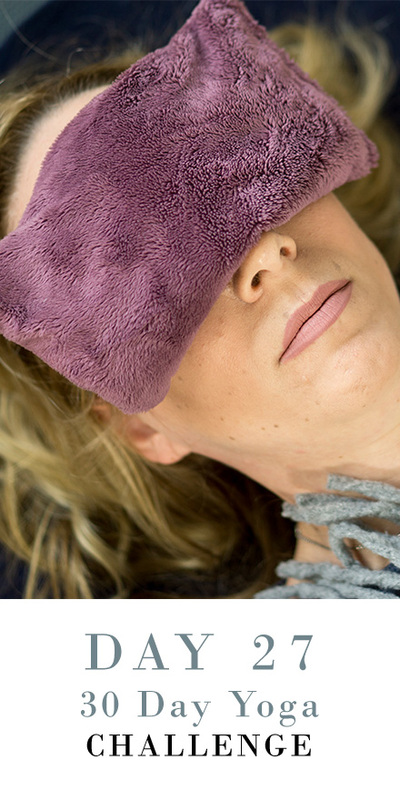 If you go enter your email below I will send you 7 days of yoga for Sleep, that is 7 days with the best of yoga, ayurveda, self massage and pranayama (or breath practices) to help you get the best night’s sleep. How to sleep with yoga. This is a vital question and I comment you on asking it. We are a culture suffering from chronic anxiety, chronic tension, and panic attacks. We are stressed out, on high alert and feel a constant urgency from everything. We are slaves to our do to list. We are wired and frazzled. We are sleep deprived and many of us experience chronic insomnia. The insomnia anxiety cycle is real and I have nothing but compassion for all of us who suffer with it. We often carry the stress of our lives into our sleep. Then we wake up and we do not feel rested. Research from the March 2017 Behavioral Brain Research Journal reported that more than 1/4 of the world’s population suffers from sleep problems. In their study they observed that inflammation of the nervous tissue and neuronal cell death continued even 3 weeks after the sleep deprivation induced in their experiment. A study in the April 2017 Oxford Academic Journal of Sleep found that restless sleep with more waking and irregular sleep timing contributing to increased perceived stress for people. We need rest. Sleep heals. When you go to sleep at night your body repairs and restores itself. During your sleep your body releases hormones that encourage tissue growth. You also make more white blood cells that attack viruses and bacteria. So how can we sleep with yoga? One of the best ways I know how is through a guided meditation called yoga nidra. Nidra means sleep. Yoga nidra is a sleep based conscious relaxation meditation technique. It is a yogic sleep where you are guided from a dream state into a deep sleep state and finally to a deep state of relaxation where your thoughts drop right off and yet you are still aware. You begin by focusing on your physical body which allows you to relax. Throughout the meditation you are taken into the deeper layers of your emotional and energetic bodies to a place where you are no longer concerned about your to do list and endless obligations. This will help you rest deeply and unwind patterns of tension and stress. Normally in our waking state our brain experiences something called beta waves. This is a fast activity that is present when we are alert and attentive and involved in problem solving, judgment, decision making and focused on mental activities. When we practice yoga nidra, we move through slower and slower brain waves starting with alpha waves which are more relaxed. As we move into an alpha wave state we become more relaxed and the mood regulating chemical neurotransmitter serotonin gets released which makes you feel more calm. The next state you go through is theta waves. Your thoughts slow down and you are able to go through emotional release and integration at this levels. This is the state your brain goes through between sleeping and daydreaming. When we get to the deepest and slowest recorded brain waves in human beings, delta waves, this is when we are getting to the juiciest place in terms of restoration. This is the level at which our organs regenerate AND the stress hormone cortisol is actually removed from your system. When you reach delta you feel completely rejuvenated when you wake up after yoga nidra or good night’s sleep. Your immune system can do its work and your body is healed and restored on a deep level. In our culture, very few people even enter into the deep states of theta to delta waves on a regular basis, let alone delta waves. So unfortunately our bodies are not restoring themselves. Which is why you are asking, How can I sleep with yoga. So my answer for you is yoga nidra.